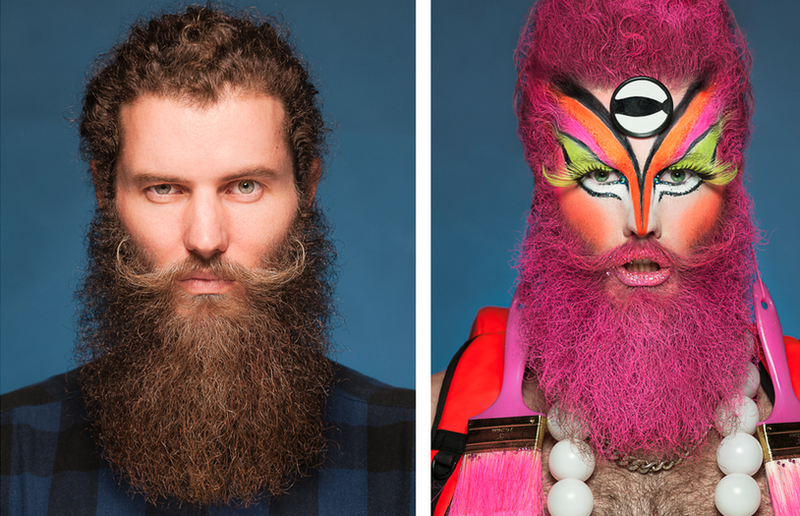 Aaron Walker's latest exhibition, presented as part of Midsumma, looks into the world of drag and what it represents. #Dragformation aims to capture and document what 'drag' is, what it means, and who the people who engage with it are through before and after portrait photography of the performer. Walker's conceptualisation for this project came through photographing the performers of a drag show backstage. "As I was shooting, what really struck me more than the show was the transformation process itself. After the show I knew I had to see if I could capture this on film in a way that needed to be a natural everyday look but also fabulous and spectacular. That’s when I chose to use a diptych to convey the effect of the drag artist’s look and persona from the street to the stage," Walker explains. "So I arranged a studio shoot with six drag artists and presented the series of portraits to my peers for feedback and thanks to social media and the connections of the delightful Miss Polly Filla (who features in the series), the curator of Watch This Space gallery in Sydney, the wonderful Travis de Jonk, got in touch. I was invited to look at the space and plan an exhibition. It was then that I realised I would need another 14 portraits, bearing in mind that they are diptychs which means it's actually another 28 portraits to plan, organise, capture, retouch, print and frame in 6 weeks while I had full-time work and other projects to complete. But it was - and still is - simply astounding how such a myriad of opportunities have been constantly falling into place to support this project, so I do feel blessed right now to be part of Midsumma Festival and Chapel off Chapel Theatre. And yes I work at a cracking pace," Walker laughs. While Walker specialises in photographing physical movement, such as circus and theatre, in #Dragformation he has chosen to work in the different field of portraiture and close-up photography. "The project started with an interest in shooting more portraiture rather than dynamic, broad physical movement which I am accustomed to working with," he says. "I was searching for a idea to drive a portrait series when a close friend of mine inherited a Hassleblad studio portrait film camera, which are famous for capturing countless world renowned portraits from the late 50’s onward. Considering the format I wanted to use I decided that it should be a classic close up and personal portrait series, with a collection of printed, larger than life images." The search for models has mainly been through contacting drag artists however Walker is attempting to reach out to the wider community in order to complete his project. "I was looking for current and previously professional working drag artists mainly but I was also willing to include individuals who have a close affinity with drag but haven't made that big step onto stage yet," he explains. "My aim has been to capture and present as wide and diverse a range within the LGBTQI community as I could but I have been up against time and location constraints so I have not been able to fulfill that goal yet. However, I will be getting in touch with all areas of the drag community nationwide very soon to see who would like to join the #Dragformation project." 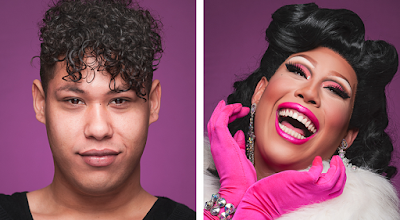 Through his work, Walker is hoping to have people consider the many roles within queer culture that drag has and how it keeps fighting against the constrictions that society places on the queer community. "Drag is about pushing boundaries, defining and constructing yourself as an artist to see just how far you can take an idea, a skill, a persona or an identity," he says. "It's a way to re-imagine yourself without societies limitations. This in turn creates a wonderful amount of transformative, subversive artistic variety, a genre of artists who don't and won't conform to the tragically limited and traditional social distinction between men and women. Another role I can relate to is family. Having that sense of belonging to an enriching, supportive extended family of similar artists is empowering and inspiring. Especially when the majority of society takes core values such as acceptance, love, marriage and equality for granted." "I think there will always be drag artists at the forefront of queer culture who are compelled to question, confront, subvert, entertain, evoke and agitate whatever boundaries and limitations society throws at the community," Walker tells me. "Today I saw a drag artist wishing everyone a Merry Xmas from an open top convertible dressed as a classy Santa on Chapel St, bringing plenty of joy and laughter to the public and completely subverting the traditional norm which we are so accustomed to. Within any community, we cannot afford to stay still, we need to keep moving and shaking, growing and adapting." #Dragformation will be on at Watch This Space Gallery during the Sydney Gay & Lesbian Mardi Gras 2017. If you are interested in being photographed for this growing exhibition (from any city in Australia), you can reach Aaron via his website: Aaron Walker Photography.